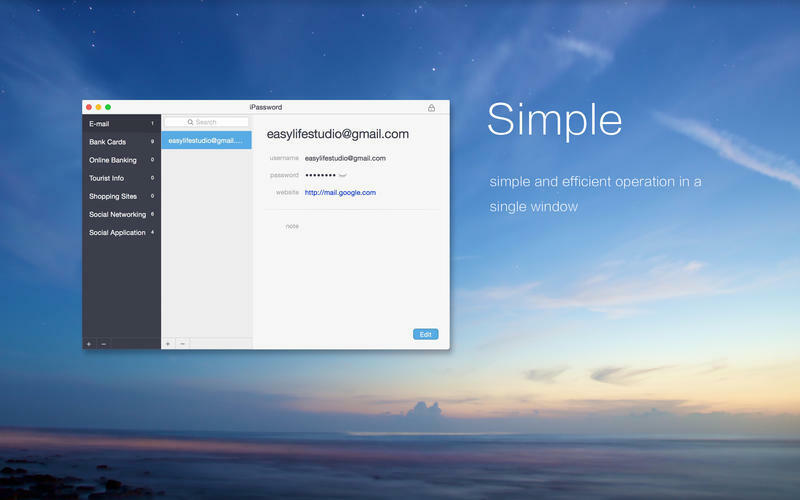 A simple and safe password management tool. Is there a better alternative to iPassword? Is iPassword really the best app in Security category? Will iPassword work good on macOS 10.13.4? 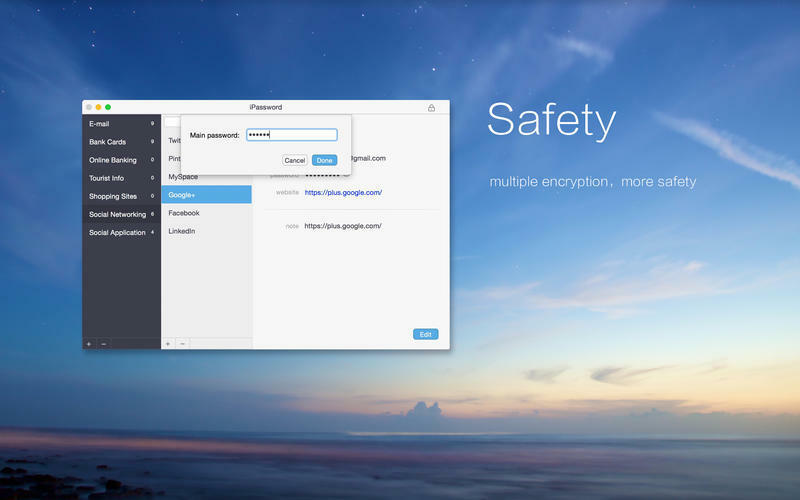 iPassword is a simple and safe password management tool. In everyday life, passwords are almost everywhere. We need to remember more and more passwords. In fact, we often forget them. Is there a tool to help me manage all my passwords? If you have the same questions, iPassword may give you some help. Simple user interface and easy operation. Support groups feature, you can classify all passwords reasonably. Fixed some bugs in macOS Sierra. Support fast search feature, which can help you quickly locate the password item you're looking for. Support free sorting feature, you can drag any password item to modify the display order of the list. Support Database import and export functions, you can back up the database in real time, or use backuped database . Support to generate a password for you. Passwords, notes and other sensitive information are encrypted using complex algorithms, make sure your information is secure. When to open the software, edit item and look up the sensitive information, you must use your main access password to confirm. So, otehers are prevented to view and modify your informations. It is a completely stand-alone software, there will not be any network behavior when using it. The password database exists only on your computer, and only you can open it with your main password, the password leak is not possible. You can backup database to your iCloud account or restore it from iCloud easily. So don't worry about losing your data sometimes.